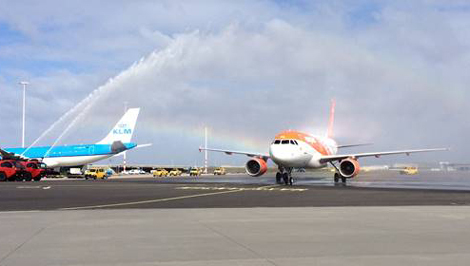 Easyjet opened its 26th base at Amsterdam Schiphol airport today. To celebrate the opening, the airline flew a special Dutch-themed aircraft, decorated with Holland’s signature tulips as livery, from London Luton to Schiphol. The carrier currently flies between London and Schiphol 108 times weekly (216 flights in total). Basing three aircraft at Schiphol, with a fourth to be added in October, will allow it to offer earlier departures for Dutch passengers. Schiphol was Easyjet’s first destination outside the UK in 1996. It announced an Amsterdam to Milan Linate route, ideal for business passengers due to its close proximity to Milan city centre, earlier this week. Easyjet will now start operating flights from Amsterdam to nine new destinations including Hamburg, Venice, Toulouse, Nice, Olbia and Dubrovnik. This brings the total number of Easyjet routes from the city to 29. CEO Carolyn McCall said Amsterdam is a particular focus for the airline, calling the new base “a strategic move”. In the last 12 months, Easyjet’s passenger capacity from Schiphol was 4.3 million with 3.8 million flown, while its capacity from the UK to Schiphol was 2.75 million with 2.4 million flown. Easyjet Plus members and Flexi fare holders now have access to fast-track security at 34 airports (see news, March 13).